Located near Lake Placid in the High Peaks Wilderness Area of the Adirondacks, the Adirondak Loj is recognized as the entrance to the High Peaks. 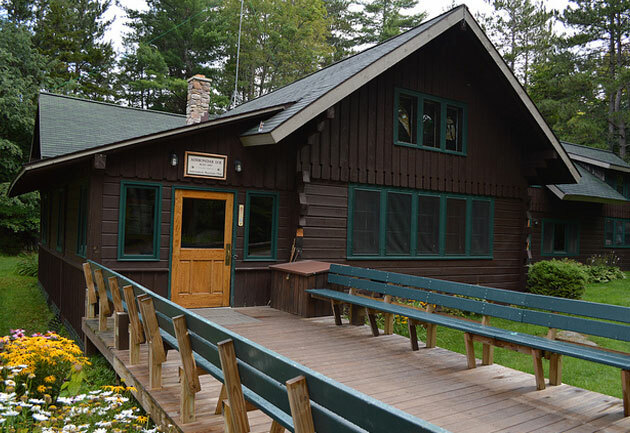 Hikers who stay at the Adirondak Loj have easy access to Algonquin Peak and Mt. Marcy (two of the 46 High Peaks), as well as the popular Mt. Van Hoevenberg and Mt. Jo. However, the lodge seen today is the successor of a late 19th century building - the first Adirondak Loj. The history of the original Adirondak Loj is intertwined with the life of its founder - Henry Van Hoevenberg. Born in 1849 in Oswego, N.Y., Henry Van Hoevenberg spent most of his early years living around Troy, NY. He was forced to drop out of school because of financial difficulties in his family, but that didn't stop him from pursuing a career in electrical engineering. Despite being self-taught, Van Hoevenberg became an engineering genius. He worked for the Baltimore and Ohio Railroad as chief electrician, and most of his work focused on telegraphic systems. His skills were so highly regarded that he was commissioned to supervise the installation of the national telegraphic system in Great Britain. As an engineer, Van Hoevenberg lived in New York City. Unfortunately, during the summer months, he was continuously afflicted by hay fever. He found refuge in the Adirondacks, and by the mid-1870s, he would only travel to the city on business or in the winter. In 1877, while camping with friends, Van Hoevenberg met Josephine Schofield. The two became engaged later that year, and during one trip together to the top of Mt. Marcy, Van Hoevenberg spotted a lake in the distance in the shape of a heart. On that day, he named it Heart Lake and decided that he wanted to build a lodge at its base. Built in 1880, the first lodge was a much larger building than the present one. Interestingly, the name of the building was spelled Adirondack Lodge; the name would receive a different spelling at a later time. The lodge was situated on a one square mile piece of land around Heart Lake. It was also at the base of a mountain, which Van Hoevenberg named Mt. Jo in honor of his wife. The lodge had a 70 foot tall observation tower, 60 rooms, and three floors. Guests could stay for $4 per day or $16 per week, with food and lodging both included. Only Van Hoevenberg would see the new lodge open its doors to visitors. At the request of her parents, Josephine Schofield returned to Brooklyn alone and soon passed away due to mysterious circumstances (some say of a broken heart). Nevertheless, Van Hoevenberg would operate the lodge from 1880-1898. He commissioned the construction of 50 miles of surrounding trails, and at times, he would entertain guests and tell stories around the campfire. In 1898, Van Hoevenberg began to have difficulties maintaining the property, and two years later, he was forced to sell the building to the Lake Placid Company, the owner of the Lake Placid Club. Van Hoevenberg continued to manage the lodge, but the founder of the Lake Placid Club, Dr. Melvil Dewey, changed its name. As an advocate of simplified, phonetic spelling, Dewey favored Loj over Lodge, and the Adirondack Lodge became the Adirondak Loj. Five years later, in 1903, the original lodge burned down due to a widespread fire near Mt. Jo and Cascade and Porter Mountains. Although Van Hoevenberg would work as an engineer for the Lake Placid Club afterward, he wouldn't see the lodge rebuilt. He passed away in 1918, years before plans for a new building were underway. In 1927, the Lake Placid Company had a new lodge built at the same location. Frederick T. Kelsey, member of the Lake Placid Club and future president of the Adirondack Mountain Club, organized the Adirondak Loj Corporation in 1932. Through the corporation, Kelsey obtained a lease of the Adirondak Loj and set up the Loj Chapter, which opened the lodge for guests throughout the year. Kelsey's lease expired in 1957 when he passed away, but the Lake Placid Company had an idea for what to do with the property. The company offered to sell it to the Adirondack Mountain Club for its original price, and the club bought it in 1958. Due to the rising popularity of the High Peaks Wilderness Area, the Adirondak Loj needed to expand. A dining room, kitchen, staff living quarters, and more sanitary facilities were all added in 1963. Today, the Adirondak Loj features all of those added amenities, as well as room enough for 38 guests in the main building. The site also has 16 lean-tos, 32 campsites, and 6 canvas cabins. With its Adirondack library, stone fireplace, and rustic setting, the historic Adirondak Loj continues to welcome guests to the High Peaks.